Madame Alexander "Breakfast in Bed" has blue eyes and pretty blonde hair pulled up in two curly ponytails on each side of her head tied with blue ribbons with a light blue ribbon. She wears a darling dress of white organza over white satin with pink flowers appliquéd over puff sleeves. The white satin bodice has a low cut neckline with an inset of pink flower-decorated sheer fabric and light blue stitching. A light blue sash with a pink rose in front and a huge blue bow in back complete the dress. She wears a double-layer pink net slip with lace trim under the dress, and opaque white tights, white patent leather shoes with bows and working snaps on the side of the straps. 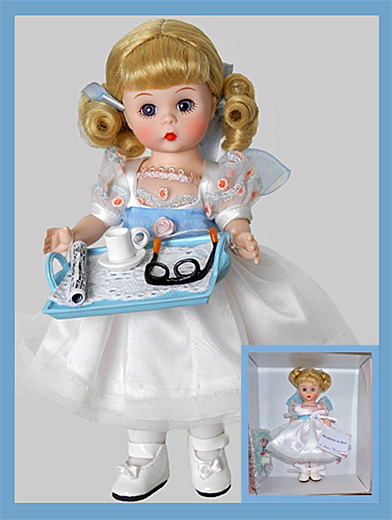 Wendy has never been displayed and comes with a light blue breakfast tray, complete with cup and saucer, pair of glasses, and rolled up newspaper on a lace mat (still attached to the side of the box).